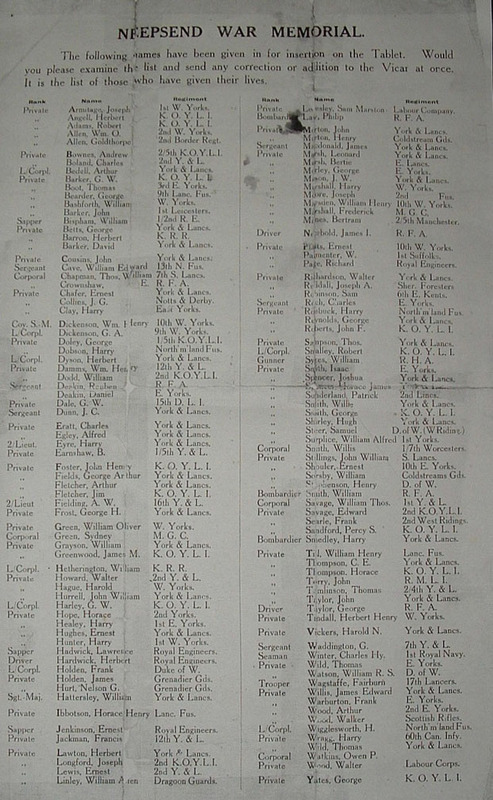 St. Michaels Neepsend - this list was put together by the vicar of the day for the purpose of which names to go on the roll of honour, we don't know if the original survives as church was demolished. We have had information that before demolition of the church the roll was relocated to the church on Nursery street ( now the New Testament Church of God) Previously we have enquired but was told it wasn't there. From Canon Odoms Memorials of Sheffield – The War Memorial in the Lady Chapel consists of a large brass containing 162 names, with the inscription: “This tablet is erected in grateful memory of the men of this parish and congregation of St Michaels, Neepsend. Who gave their lives for their country in the Great War, 1914-1918. May they rest in peace.” The cost was £170.